Behrens, Bergljot; Schaeffer, Moritz; Sturm, Annegret & Heilmann, Arndt (2015). The Role of Syntactic Choices in translation and post-editing. Translation Spaces. ISSN 2211-3711. Behrens, Bergljot; Fabricius-Hansen, Cathrine & Frazier, Lyn (2014). Pairing Form and Meaning in English and Norwegian: Conjoined VPs or Conjoined Clauses?, In Barbara Hemforth; Cathrine Fabricius-Hansen & Barbara Mertins (ed. ), Psycholinguistic Approaches to Meaning and Understanding across Languages. Springer Publishing Company. ISBN 978-3-319-05674-6. chapter 3. Behrens, Bergljot; Hemforth, Barbara; Mertins, Barbara & Fabricius-Hansen, Cathrine (2014). Understanding Coordinate Clauses: A cross-linguistic experimental Approach, In Barbara Hemforth; Cathrine Fabricius-Hansen & Barbara Mertins (ed. ), Psycholinguistic Approaches to Meaning and Understanding across Languages. Springer Publishing Company. ISBN 978-3-319-05674-6. chapter 2. Behrens, Bergljot (2006). What the Structure of Criterion Predicates Told Me, In Torgrim Solstad; Atle Grønn & Dag Trygve Truslew Haug (ed. ), A Festschrift for Kjell Johan Sæbø: In Partial Fulfilment of the Requirements for the Celebration of his 50th Birthday. Forfatterne. ISBN 978-82-997289-0-4. artikkel. Taking non-correspondences regarding coordinated constructions in translation as a starting point, we discuss the interpretation of coordinated structures as compared to non-coordinated alternatives. We show that Norwegian tends to exploit coordination somewhat differently than English or German, and point at some interesting theoretical implications with respect to discourse structure and discourse relations. Det blåses liv i Sapir/Whorf-hypotesen om forholdet mellom språk og tanke. Typologiske forskjeller mellom engelsk, tysk og norsk påvirker perspektivet informanter tar på en rekke hendelser de er bedt om å sette ord på. Analysene bygger på informantdata innsamlet ved Universitetet i Heidelberg og Universeitetet i Oslo. Artikkelen tar spesielt opp a) setningsåpning i de tre språkene og b) utvelgelse av nevneverdige objekter. Begge temaene analyseres i lys av forskjeller i grammatikaliserte struktureer i de tre språkene. The present volume draws together contributions from a number of scholars with an interest in empirical, cross-linguistic description. Most of the papers were first presented at the symposium Information Structure in a Cross-linguistic Perspective held in Oslo in November/December 2000. The descriptions are functionally oriented, and their common focus is how information structure ¿ in a broad sense ¿ can be compared across languages. 'Information structure' has been approached in a variety of ways by the authors, so as to give a broad picture of this fundamental principle of text production, involving the way in which a speaker/writer chooses to present a message in terms of given/new information, focus, cohesion, and point of view. Central to much of the research is the problem of establishing criteria for isolating linguistic constraints on language use from cultural-linguistic conventions in text production. The linguistic comparison includes English, German and/or one of the Scandinavian languages, with sidelights to other languages. Most of the papers are text- or corpus-based, and the ongoing work on parallel corpora in Scandinavia is reflected in several contributions. Behrens, Bergljot (2018). Access to internalized grammar in L2 and translation. Behrens, Bergljot; Pitz, Anneliese Pauline; Helland, Hans Petter & Fabricius-Hansen, Cathrine (2017). Introduction to Possessives in L2 and translation: basic principles and empirical findings.. Oslo Studies in Language (OSLa). ISSN 1890-9639. 9(2), s 1- 2 Fulltekst i vitenarkiv. Behrens, Bergljot (2016). Process based translation studies. Behrens, Bergljot (2016). Processing Possessives in English-Norwegian Translation..
Behrens, Bergljot (2016). Product based translation studies. Behrens, Bergljot (2016). Researching procedural information in translation: an evaluation. Behrens, Bergljot (2016). Restructuring processes in Translation. Behrens, Bergljot (2016). SPROSS (språklig prosessering) - forskning på leseforståelse i L2 og oversettelse til L1. Novice and professional translators have been found to translate possessive pronouns differently when they appear in an English participial adjunct clause like the following: Peter found the dog sleeping in his car. The problem arises because Norwegian distinguishes between reflexive (SIN) and non-reflexive (HANS) possessive pronouns. With a view to translation training, what ‘grammar’ is it that the professional translator has internalized? Both groups being L1 speakers of the target language, they would be expected to have the same internalized grammar. Their different solutions, however, may indicate that this is not the case, and that priming is not the only answer to the differences. Possibly, novices have a vaguer representation in need of cognitive restructuring and strengthening. In this paper I discuss constraints on binding for possessive pronouns in Norwegian, with reference to analyses found in the INESS grammar for Norwegian and to translation process data recently collected from 11 students and 11 professional translators. Behrens, Bergljot (2016). The translation task - what's holding the translator up?. Behrens, Bergljot (2014). Gazing at the Source text i translation - what's going on?. Behrens, Bergljot (2014). Translating - What's holding you up?. Behrens, Bergljot (2014). Translation Research at the University of Oslo. Behrens, Bergljot; Schmiedtová, Barbara; Fabricius-Hansen, Cathrine & Hemforth, Barbara (2012). Understanding coordinate clauses in Czech, English, German, and Norwegian. Fabricius-Hansen, Cathrine; Behrens, Bergljot; Clifton Jr, Charles & Frazier, Lyn (2012). Pairing form and meaning in English and Norwegian: Conjoined VPs or conjoined clauses?. Hemforth, Barbara; Borthen, Kaja; Schmiedtová, Barbara; Behrens, Bergljot & Fabricius-Hansen, Cathrine (2012). Referring expressions in direct and indirect speech in Czech, English, German, and Norwegian. Behrens, Bergljot (2011). Expository texts and norms in translation. Behrens, Bergljot (2011). Fremmedgjøring i oversettelse -et litterært og et lingvistisk perspektiv. Behrens, Bergljot & Schmiedtová, Barbara (2011). Achievement of Written Narrative Competence in L2: Comparing German and Norwegian Learners of English. Behrens, Bergljot; Schmiedtová, Barbara; Hemforth, Barbara & Fabricius-Hansen, Cathrine (2011). Understanding coordinate clauses: a cross-linguistic experimental approach. Behrens, Bergljot (2010). Kompensasjon i oversettelse. Behrens, Bergljot (2010). Syntax at play with discourse relations. Solfjeld, Kåre; Behrens, Bergljot & Fabricius-Hansen, Cathrine (2010). Syntactic form at play with discourse relations. Behrens, Bergljot & Solfjeld, Kåre (2009). Discourse role guiding clause type and relative position in translation. Solfjeld, Kåre & Behrens, Bergljot (2009). Discourse role guiding translation choice. In this paper I discuss the absentive characterization of the locative structure "be out and V" in Norwegian and argue that translation between this structure and the English progressive requires a "conceptual shift" from the spatial domain to the temporal domain. The strong locative feature of the Norwegian forms is taken to be a relevant factor in explaining the misuse of the progressive by even advanced Norwegian speakers of English as a second language. Behrens, Bergljot (2008). Linearization of narrative in English L1 and advanced L2. Coordinating structure. Fabricius-Hansen, Cathrine & Behrens, Bergljot (2008). Expository texts. Behrens, Bergljot (2007). Contrastive linguistics: an overview. Data and research goals. Behrens, Bergljot (2007). "Non-finite dependencies and discourse structure". Behrens, Bergljot (2007). Parallel Corpora and lexical semantics. Semantic Mirrors. Behrens, Bergljot (2007). Semantics and pragmatics in Contrastive Analysis. Fabricius-Hansen, Cathrine; Behrens, Bergljot & Krave, Maria Filiouchkina (ed.) (2006). Pre-Proceedings of the SPRIK Conference 2006: Explicit and Implicit Information in Text. Information Structure across Languages. Behrens, Bergljot (2005). Ekvivalens og/eller relevans i oversettelse. Behrens, Bergljot (2005). On the interface between advanced L2 and marked translation into L1. 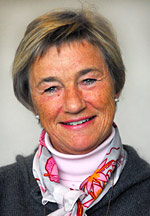 Behrens, Bergljot & Fabricius-Hansen, Cathrine (2005). Temporal and non-temporal dimensions of the discourse relation Accompanying Circumstance. Behrens, Bergljot & Fabricius-Hansen, Cathrine (2005). The discourse relation Accompanying Circumstance across languages. Conflict between linguistic expression and discourse subordination?. Solfjeld, Kåre; Ramm, Wiebke; Behrens, Bergljot & Fabricius-Hansen, Cathrine (2005). Coordination, discourse relations, and information packaging - cross-linguistic differences. Solfjeld, Kåre; Ramm, Wiebke; Fabricius-Hansen, Cathrine & Behrens, Bergljot (2005). Coordination, discourse relations, and information packaging - cross-linguistic differences. Behrens, Bergljot (2004). Markerte trekk i norske oversettelser. Behrens, Bergljot (2004). Voice in literary translation. The Norwegian connective DERMED is discussed in a semantic and translational perspective. The semantic meaning is found to be vague and context is found to be important for restrcting the relation between the propositions linked. The use of the connective in Norwegian translation clearly influenced by the source language. Behrens, Bergljot (2003). Pidgin-norsk eller mellomnorsk - om språklige trekk i oversettelse av tekster fra flerkulturelle mijøer. Behrens, Bergljot & Christensen, Bente (red.) (2003). Oversettelse i teori og praksis. Rapport fra 1. seminar om oversettelse i samarbeid mellom ANLA, Norsk Oversetterforening og Universitetet i Oslo, mai 2003. Oversetterens ansvar, oversettelsesstrategier, implisitt informasjon i kontrastivt perspektiv. hvordan norske hendelsesbeskrivelser fremstår i forhold til tyske og engelske. Norsk muntlig språkdata sett i lys av engelske og tyske data på grunnlag av samme input. Fabricius-Hansen, Cathrine & Behrens, Bergljot (2001). Crosslinguistic constraints on expressing elaboration. Denne forelesningen har et dobbelt mål. På den ene siden vil vi diskutere Elaborering som en semantisk setningskoplingskategori. Vi er spesielt interessert i hvordan elaboreringer uttrykkes i engelsk, tysk og norsk, og hvordan et kontrastivt studium av variasjonen i uttrykksmidler kan bidra til å få isolert bestanddelene i kategorien. På den annen side vil vi fokusere på metode i kontrastive språkstudier. I vårt kontrastive studium av Elaborering gjør vi utstrakt bruk av søk i parallellkorpuset OMC. Vi presenterer Dyvik-metoden, og viser hvordan den gir oss tilgang til viktige data for vår analyse. Diskurslenking, underordning og oversettelse "I oversettelse mellom språk må vi ofte gjøre om og flytte på elementene i originalteksten for å få en naturlig tekst i mottakerspråket. I denne forelesningen vil jeg diskutere bisetningers funksjon i et tekstlig perspektiv og vise hvordan plasseringen kan ha konsekvenser for tekstens innhold. En bevisstgjøring av forholdet mellom bisetningenes plassering og tekstens innhold kan bidra til å etablere regler for tekstmanipulering i oversettelse. Tekstmaterialet er på norsk og engelsk." I forelesningen gi jeg en oversikt over vanlige strategier i oversettelse mellom engelsk og norsk, og diskuterer dem som grunnlag for en lingvistisk orientert teori om oversettelse. Eksempler er hentet fra eget materiale og OMC. The lecture presents the design of the Oslo Multilingual Corpus, and the contrastive linguistic research made possible by it. Examples are given of discourse semantic as well as lexical semantic descriptions made on the basis of systematic corpus research. The paper aims to contribute to the explication of the discourse theoretic concept Elaboration and the semantic description of relevant connectives in three closely related languages. The paper focuses on the variety of expressions used to signal this relation in German, English and Norwegian, and the apparent consequences such a variety may have for semantic representation. The method used is translational: authentic texts and their translations are used to establish correspondences as "semantic mirrors" (Dyvik 1998). The study is part of a larger project currently developing at the University of Oslo, in which we aim at reaching new insight into the ways discourse is structured in the three languages, on the basis of data collected from the Oslo Multilingual Corpus (OMC). Fabricius-Hansen, Cathrine & Behrens, Bergljot (2000). Elaboration and related discourse relations viewed from an interlingual perspective. Behrens, Bergljot & Sæbø, Kjell Johan (1997). Events and Context Sensitivity.